Careful! These Cars are Sharp! It’s a pretty safe bet that motorists traveling along Pendleton Pike in Lawrence have noticed renewed activity at the former home of Burd Ford, Inc. – and for good reason. The impressive structure at 10320 Pendleton Pike has a new tenant. Gone are the blue and white oval Ford Motor Company signs perched atop poles in the 45,000 sq. ft. car lot. The familiar Burd logo has been removed from the building’s facade, replaced by one that reads Sharp Cars. In mid-August, Bob Thomas, the owner of Capitol City Ford on East Washington Street, launched Sharp Cars at the former Burd location. On the heels of Burd’s closure, Thomas signed a ten-year lease for the land and building as part of an agreement with Ford and another area car dealer. “We have enjoyed an enthusiastic reception from the community,” explained the savvy Thomas who owns multiple auto dealerships, including three in Fort Wayne. Sharp Cars is located in the former Burd Ford dealership on Pendleton Pike in Lawrence. 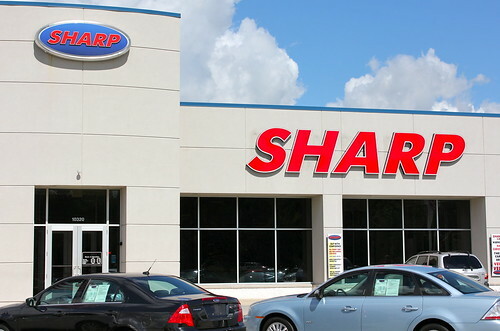 Additional information about Sharp Cars is available online at www.sharpcarsofindy.com and by phone, 317.545.8551.